Here is my selection of the best books for learning about and being inspired by the late Steve Jobs! I have read or thumbed all (except two, not yet published) of these, and can recommend them for your own, personal benefit -- or as a superb gift for anyone on your gift list this year! Based on more than forty interviews with Jobs conducted over two years - as well as interviews with more than a hundred family members, friends, adversaries, competitors, and colleagues - Walter Isaacson has written a riveting story of the roller-coaster life and searingly intense personality of a creative entrepreneur whose passion for perfection and ferocious drive revolutionized six industries: personal computers, animated movies, music, phones, tablet computing, and digital publishing. Drawn from more than three decades of media coverage - print, electronic, and online - this tribute serves up the best, most thought-provoking insights ever spoken by Steve Jobs: more than 200 quotations that are essential reading for everyone who seeks innovative solutions and inspirations applicable to their business, regardless of size. Jobs made an indelible mark in multiple industries, and played an enormous role in creating others. Consider how Jobs and Apple shaped the following fields: personal computers (laptop and desktop), apps (for multiple electronic devices), computer animation (Pixar), music (iTunes), telecommunications (iPhone), personal digital devices (iPod), books (iBook), and, most recently, tablets (iPad). Jobs was the greatest business visionary of our era. I, Steve is the perfect gift or reference item for everyone interested in this great American original. Steve Jobs' legacy is clear: The most innovative business leader of our time, the man FORTUNE named CEO of the Decade in 2009. Now from the pages of FORTUNE comes an anthology of 17 classic stories spanning the years 1983 to 2011 about the cultural icon who revolutionized computing, telephones, movies, music, retailing, and product design. The stories lay out in unparalleled detail the career of a man with relentless drive and a single underlying passion - to carry out his vision of how all of us would use technology. Writes managing editor Andy Serwer in the book's foreward: "In the end he was proved right a billion times over, and his company Apple became one of the most successful enterprises on the planet." All these stories are the product of deep reporting. In many cases FORTUNE's writers spent hours interviewing Jobs and delving into his mind. The result is a singular journalistic collection, which will leave you with a comprehensive picture of Steve Jobs and Apple, a picture that is complex in the making yet simple in its triumph. Former Apple CEO Steve Jobs's wildly popular presentations have set a new global gold standard - and now this step-by-step guide shows you exactly how to use his crowd-pleasing techniques in your own presentations. The Presentation Secrets of Steve Jobs is as close as you'll ever get to having the master presenter himself speak directly in your ear. Communications expert Carmine Gallo has studied and analyzed the very best of Jobs's performances, offering point-by-point examples, tried-and-true techniques, and proven presentation secrets that work every time. With this revolutionary approach, you'll be surprised at how easy it is to sell your ideas, share your enthusiasm, and wow your audience the Steve Jobs way. In 1984, The Little Kingdom told the story of Apple's first decade alongside the histories of Steve Jobs and Steve Wozniak. Now Moritz revisits his classic biography in light of what Apple has become, offering for the first time in paperback the only from the ground up account of Apple's early years. Owen Linzmayer's Apple Confidential is subtitled The Real Story of Apple Computer, Inc., and while nobody will ever know the complete, "real" story about Apple, Linzmayer's is probably as close as they come. Having covered Apple news since 1980, he offers extensive insider details about Steve Jobs, Steve Wozniak, John Sculley, Gilbert Amelio, Bill Gates, and other major players whose lives were (and are) intertwined with Apple's history. And along the way, we also learn about lesser-known figures whose stories have remained hidden in the Apple myth: Ronald Gerald Wayne, for example, who was actually a partner with Wozniak and Jobs in the original incarnation of the company, but who sold his share when he realized he would be financially vulnerable if it should fail. By following Steve Jobs's visionary example, you'll discover exciting new ways to unlock your creative potential and to foster an environment that encourages innovation and allows it to flourish. You'll learn how to match - and beat - the most powerful competitors, develop the most revolutionary products, attract the most loyal customers, and thrive in the most challenging times. Bestselling business journalist Carmine Gallo has interviewed hundreds of successful professionals--from CEOs, managers, and entrepreneurs to teachers, consultants, and stay-at-home moms - to get to the core of Steve Jobs's innovative philosophies. These are the simple, meaningful, and attainable principles that drive us all to "Think Different." These are The Innovation Secrets of Steve Jobs. An enhanced ebook is now available with 10 demonstration videos of Jobs' sure-fire innovation secrets. Select the Kindle Edition with Audio/Video from the available formats. 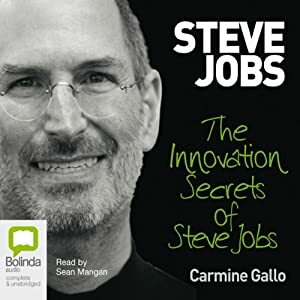 In The Innovation Secrets of Steve Jobs, best-selling author Carmine Gallo reveals the qualities that make the Apple co-founder the most innovative leader in business today. Each principle is backed with research, quotes, and first-person interviews with experts and business leaders, as well as specific ideas for applying those principles to every business, large or small. By following Steve Jobs' visionary example, you'll discover exciting new ways to unlock your creative potential and to foster an environment that encourages innovation and allows it to flourish. You'll learn how to match - and beat - the most powerful competitors, develop the most revolutionary products, attract the most loyal customers, and thrive in the most challenging times. There was a time, not too long ago, when the typewriter and notebook ruled, and the computer as an everyday tool was simply a vision. Revolution in the Valley traces this vision back to its earliest roots: the hallways and backrooms of Apple, where the groundbreaking Macintosh computer was born. The book traces the development of the Macintosh, from its inception as an underground skunkworks project in 1979 to its triumphant introduction in 1984 and beyond. 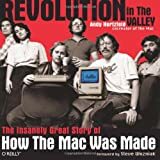 Through lavish illustrations, period photos, and Hertzfeld's vivid first-hand accounts, Revolution in the Valley reveals what it was like to be there at the birth of the personal computer revolution. The story comes to life through the book's portrait of the talented and often eccentric characters who made up the Macintosh team. Now, over 20 years later, millions of people are benefiting from the technical achievements of this determined and brilliant group of people. Any of these will make great reading, or a wonderful gift for the Apple fan on your gift list. All are jam-packed with wisdom, innovation and the spark of inspiration to thrill anyone in today's technology driven world.